Maximizing Progress: Stellar Ripple ~ NASA Spots Cartwheel Galaxy! 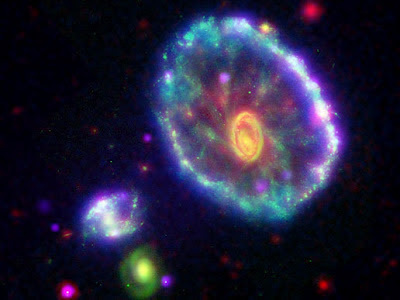 "This false-color composite image shows the Cartwheel galaxy as seen by the Galaxy Evolution Explorer (GALEX), the Hubble Space Telescope (green); the Spitzer Space Telescope (red); and the Chandra X-ray Observatory (purple). Although astronomers have not identified exactly which galaxy collided with the Cartwheel, two of three candidate galaxies can be seen in this image to the bottom left of the ring, one as a neon blob and the other as a green spiral."